Elephant Sport » Where are all the BBL fans? Rows of empty seats for a cup semi-final – a lasting image from my first live professional basketball game. It’s a sport a lot of us play at school but one that doesn’t doesn’t really have much a foothold in the consciousness of the British sporting public. 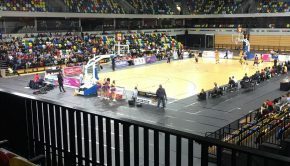 Nevertheless, I was excited to be attending the BBL Cup semi-final first leg between London Lions and Leicester Riders at the Copper Box Arena in Stratford. The 7,500-seat venue was built for the 2012 London Olympics and is fantastic facility. The Lions are the capital’s only pro outfit, while the Riders are the oldest side in British basketball, so it was a clash of big teams. But when I arrived my first thought was: where is everyone else? I couldn’t believe the amount of empty seating. Two big sides two games away from a final, but where was the atmosphere? The Lions like to say their home is ‘The Box That Rocks’, but there wasn’t much rocking going on. As tip-off approached, the tempo was raised a little, but not that much. This was largely down to the Lions’ attempts to try and recreate the NBA’s razzamatazz, with cheerleaders, player intros and fan giveaways – at least they were making an effort. The arrival of the players on court to warm up did get the crowd going a bit, and then came something I wasn’t expecting – the pre-match singing of the national anthem. Whilst this may be a regular feature in the US, in this country we only tend to have it at internationals. But it was sung loud and proud, and was a nice touch. The other noticeable difference was how the courtside announcer also kept up a running commentary on the game and tried to get the crowd going – with limited success. After a fairly even start, with defences on top, the Riders’ pressure eventually paid off and they led at the end of the first quarter. 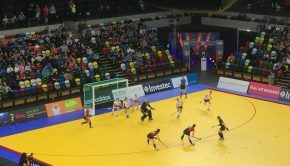 As the game progressed through the second and third periods, the visitors opened up a healthy lead, but the stubborn Lions refused to let them get out of sight and closed the gap as the match headed into its final 10-minute phase. This was a tense battle and finally gave the home fans something to shout about, but in the end, the visitors’ quality shone through as they ran out 77–65 winners, taking a 12-point lead into the return leg at Leicester on December 5th. As a first-time spectator, I enjoyed the match hugely. It was played at a frenetic pace throughout, and you could see the passion and commitment that the players put in. 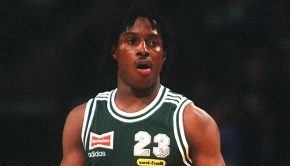 Lions forward Kai Williams was their stand-out talent. As well as being top scorer, his combination of size and skill was hugely impressive. But the stop-start nature of the contest was very frustrating – whenever I was about to get out of my seat with excitement, the game stopped. 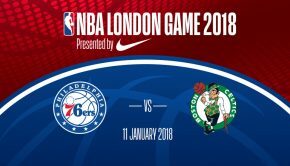 As good as these guys are, however, I couldn’t help but feel are they playing in the BBL simply because they weren’t up to the standard of the NBA or the other leagues around Europe in countries where basketball is more popular. But I kept coming back to my first impression – the lack of fans. True, it was a Thursday evening, and I’m told the Lions get better crowds when they play on Fridays and Sundays. But surely in a city of 8.5 million people, the BBL should be able to pull in more than what looked, at best, like just a couple of thousand spectators. Basketball is a great sport, and the Lions play in a great venue. Tickets are also very reasonably priced, starting at £7 for kids. I paid £22, as opposed to the £60-70 I usually pay to watch Tottenham Hotspur. So why was the arena so empty? Are people just not interested in the British game? Is it not being marketed and promoted well enough? Is there no room in people’s busy lives for another sport?